Yesterday, we were happy to report that Samsung is beaming the latest Android 5.0 update for the Samsung Galaxy S5 in Europe - more specifically, Spain and Poland. This means that impatient European owners can already update their SM-G900F handsets to the latest firmware by unofficial means. If you feel like taking the shot, get through the following hoops before proceeding with the instructions. You must be on a Windows PC, because the Samsung ROM flashing tool, Odin, is officially available only on Windows. There is a third-party, browser-based version for Mac written in Java, and Samsung Kies for Mac contains the necessary USB drivers. However, we don't have the means to walk Mac users through the procedure. You need Galaxy S5 firmware version G900FXXU1BNL9 - download here. Unzip the archive to a folder of your choosing. This is an unbranded version of the latest Android 5.0 firmware for the Galaxy S5, which was first released in Poland and region-locked. It can be installed on any unlocked SM-G900F Galaxy S5, regardless of the country it's in and the region it has been set to. You will need the Galaxy S5 USB drivers installed on your computer - download here. You will need Odin 3.09 on your computer - download here. This is the ROM Flashing tool for Samsung Android smartphones and tablets. It has no installation process - just extract it from the archive. You must charge the Galaxy S5 until it's at above 80% battery. Also, you should know that the firmware update will erase all your stored data, so having a backup of it might be essential to you. Head here to get some good ideas how to safely backup your app data, calendar, contacts, multimedia and such. If your S5 runs a custom ROM, is rooted, and has a custom recovery, you'll have to kiss them goodbye as well. Everything will be reverted back to stock. Be sure to check your Galaxy S5's model number before proceeding! Go to Settings, About phone, Model number. It has to be SM-G900F! We won't be held responsible if the update process results in damage to your device. Did you download and install everything? Back up your data? Still feel like taking the risk? Good, let's get to it! 1. Enable USB Debugging mode on the Galaxy S5 from Settings, Developer Options. If you can't find the menu, go to Settings, About Device, Build Number, then tap on Build Number seven times. If you see a pop-up notification that counts down the steps away from being a developer, you've hit home. 2. Power off the Galaxy S5. Then, turn it into Download Mode by pressing and holding the Home, Power, and Volume Down buttons. Then, press the Volume Up button to enter Download Mode. Just in case your Galaxy S5 gets stuck on this part for some reason, you can hold down the Power button, or take out the battery and put it back in. Both methods will reboot your smartphone to normal. 3. Start Odin in Administrator mode by right-clicking the shortcut and choosing Run as Administrator. Now, connect the Galaxy S5 to your computer. Look for the ID:COM box turning light blue with the COM port number - that means Odin has detected your device and we're good to go. 4. Now, click the AP button (4), navigate to the folder where you extracted the firmware archive, and select the .tar.md5 file. Tick the Auto Reboot (1) and F.Reset Time (3) checkboxes. Make sure the Re-Partition checkbox (2) is unchecked. If everything is going fine so far, click the Start button (5) in Odin. 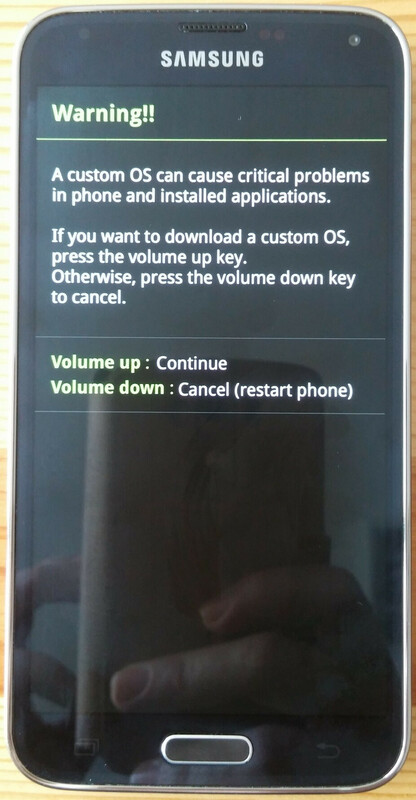 When the update its completed, the Galaxy S5 will restart automatically and boot into the new firmware. You can now disconnect the GS5 from the computer. Congrats! Why can't they just have a global release all together instead of region by region. The exynos version can expect Lollipop update no sooner than Feb most probably. I agree, I think it's so if there's any bugs, especially ones that comprise security, they can be addressed sooner. Each region has a slightly different modem and CSC file. Again, kudos for Samsung for finally learning how it is done. kudos for early release, but they are far from "learning how is done". They should learn from Apple, this is how an update is properly disseminated to devices. Since i updated my S 5 i am facing issues... Health app is not functional and Camera get black and gives error... Any one else who updated to lollipop via Odin? I am now worried every time camera get out of order error and i have to restart the device. I updated 900F to Lollipop and issues are there..